The Fisher Scientific Mini Centrifuge provides a rugged, durable mini centrifugation ideally suited for PCR preparation and tissue culture assays. 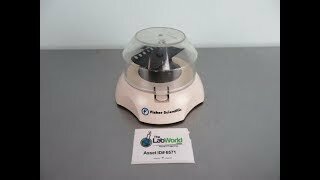 These mini centrifuges from Fisher Scientific can spin samples up to 6400 RPM's and can be user with a two place rotor for 8 x 0.2mL strips or 16 single tubes, or a fixed-angle rotor sold separately. This compact centrifuge has a built-in lid activation which is used as an on an off switch with immediate acceleration to achieve top speed of 2100 x g Force. The Fisher Scientific Mini Centrifuge is used for quick spin downs from walls, or caps of centrifuge tubes, microfiltration of HPLC samples and cell separations, and short-term cold-room use. This microcentrifuge features a clear polycarbonate lid that allows maximum visibility, and nonskid rubber feet. This Fisher Scientific Mini Centrifuge comes fully tested to factory specification and is currently ready for shipment. All of our lab equipment comes backed with our standard warranty. Should you have any questions, please don't hesitate to contact us.